So good to be back with the gang again!! This is book 4 of the series but focuses more on Aleks rather than Zaria. Alek wants to be normal, he wants to be human, he wants normal ears, but being like that will come at a cost for him! He will lose his ability to never get lost, he is willing to do that now, but when Aleks's sister shows up and looks for their help, he might realise that he is more necessary than he originally thought. You don't realise how much you miss things till they are gone, and this is the case with this series. The characters had a way of worming themselves into my heart and I missed them! Well they are back and better than ever!! Zaria, Geirr, Filip, Aleks, and Christoffer!! Their bond is something to relish in and their friendship is great to read. They look out for each other and they work well together. There's no badness between any of them, and they just make you miss the time when you were young and friendship was about friendship and nothing more. This is just as adventurous and exciting as the previous 3. The action starts right at the beginning and it's non stop till the end. They are facing a new foe, one who can make you doubt everything! One who seems to be badder than the other ones they've faced. This is also packed with so much magic, fantastical creatures and lore, that it was a breeze to read. I flew through it and was sorry to see it end!! In all, a great book. It's hard not to root for those kids and it was so nice to get to know Aleks a bit better. This series is great for any age and I can't wait for more!! Michele Carpenter does a fantastic job with this book. She has a great array of tones and voices for them and really knows how to perform the story. I love her tones for the kids!! Enjoyable performance. Its a bird Its a plane Its ZARIA! No its Aleks? Same setting, same intrepid band of adventurers, but this time Aleks takes center stage. And let us not forget his sister; Who could Ignore Nori? No really, could you? just Thinking about her makes me want to sniffle... Have pity on the poor narrator! It's time for another adventure, but with all the chaos of a normal life, who has the time? Even though most of the faces and places are familiar, with the time that has passed, many things have changed and evolved. This story is a growing up and coming of age story for many of the characters where old things are forgotten and new truths are revealed from the most unlikely sources about the most twisted and shocking of things. This story has more than one tale to it, and it can reach out and snare you from unexpected directions. Aleks has many decisions to make, and many things that were thought lost to uncover. The question is can he do it in time? The better question is does he want to? Unfortunately since book 5 is not out yet, so I must find a way to sneak a Star Gazer along with a thousand pesky request letters in the mail to the author to try to get the next one to come out faster! 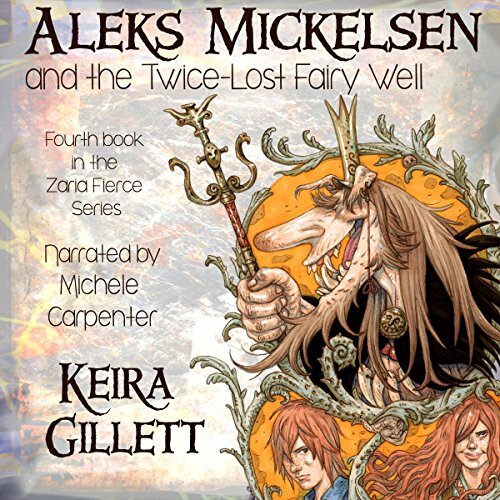 Book 4 of the series is told - as the title suggests - from the point of view of Aleks Mickelsen. Zaria is still part of the story though of course. I simply love the series as it stimulates the imagination so much. The books are so entertaining and full of all kinds of fairytale creatures - dragons, hags, mares, dwarfs and so on. I really enjoyed this new addition into the world of Zaria Fierce. Catching up with all the old friends, and getting to know them better, with the introduction of a few new ones. Aleks and his sister have some interesting things to work through, I’m looking forward to seeing where it goes, and if she matures. Michele’s reading continues to improve, I really enjoyed her performance of this book. And as always, Gillett uses some great words throughout. Keeps me paying attention, and my vocabulary sharp.